I was asked to make a cake for the dinner that the Airforce base does once a month for the warriors who stay here at the hospital while recovering from injuries they get down range. This month the KHAC or Kaiserslautern Hispanic American Club was hosting and as it’s also Halloween month. They wanted both a cake that represented their club, but also the holiday. In came Day of the Dead! I was so excited! First I did some research. I found so much inspiration online that I almost went into creative overload, so I focused my theme on the two major things I saw in pictures, skulls and bright colors. The cake was vanilla, and chocoate pumpkin. 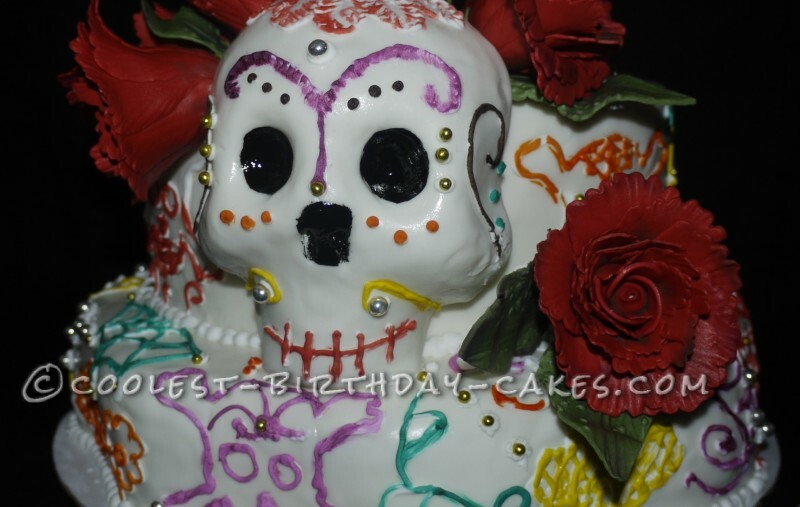 I started by filling my chocolate skull mold with white chocolate and once set, covered it in fondant. I set it aside and worked on the roses in an assembly line fashion. Anyone who’s done roses knows, they take so much time. So for the next few days I would add a layer, dry, add a layer, dry. All in all they took about 6 days. Once ready for the cake, I did a simple stack and cover in white fondant. 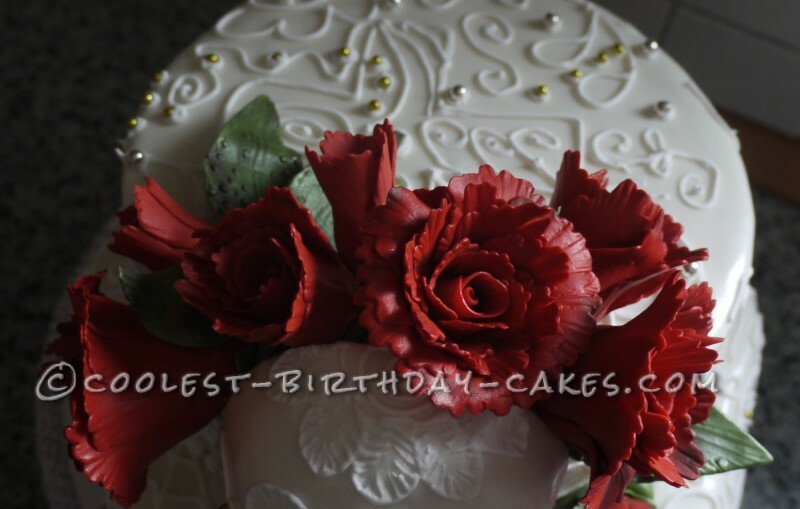 Then, using my research I made royal icing and piped different and interesting designs all over the cake. Not one style was repeated. I took edible gold and silver balls and using the wet royal icing stuck them all around the cake to shine it up and give it a sparkle. Then my 6 year old wanted to get involved. 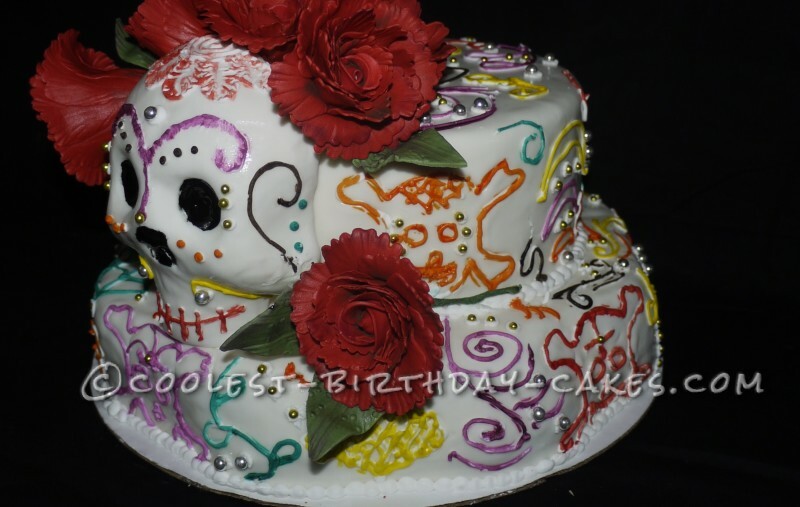 So I used a little vodka and food coloring to make different colored paint and once the royal icing was set, let him paint all of the little lines and designs all over the cake. My son has autism so his attention to details is awesome and he loves to help, so he always gets to. No matter what he’s always helped in some way in every one of my cakes. 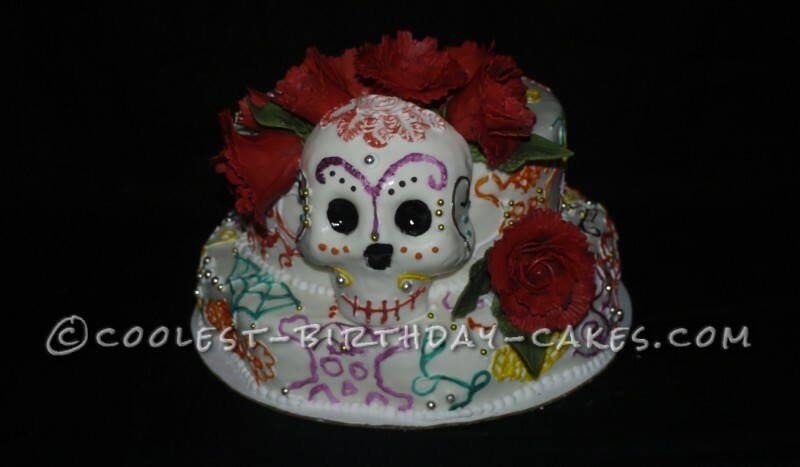 After the paint dried I used a blob of buttercream to mount the skull to the side of the cake and added the roses. It was a huge hit at the center and brought a lot of smiles to the men and women that deserve anything and everything we can offer them.